I think I just discovered the next “big thing.” Well, my sister Tanya discovered it while they were on vacation in Maui. 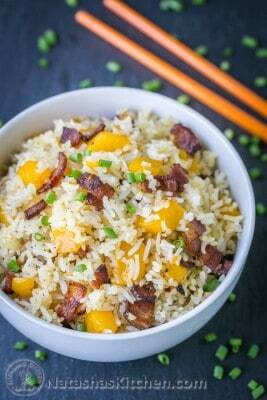 She said they ran out of groceries and all they had were mangos, bacon and rice so she came up with this fried rice. It’s wonderful and is as original as they come. The mango caramelizes with the crisp bacon for an exotic flavor combination that will rock your taste buds. Oh and there are only 3 ingredients and it takes about 15 minutes to make! 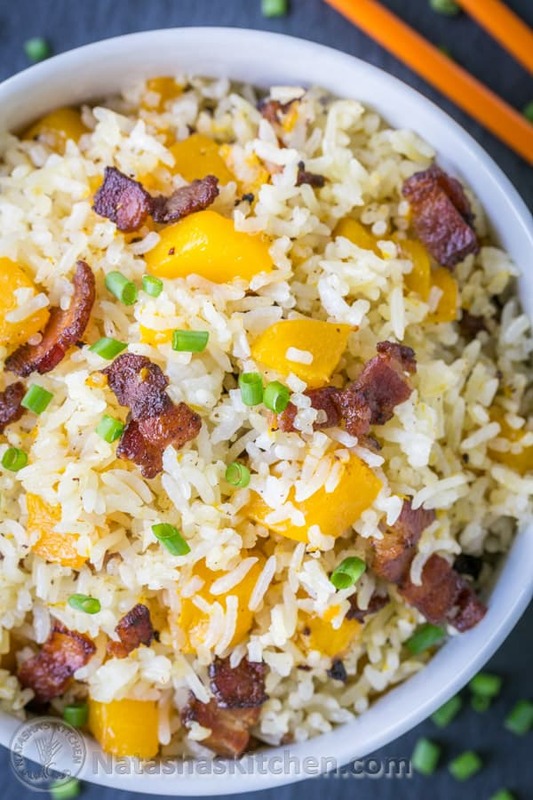 Tip: This works best with refrigerated day old rice. 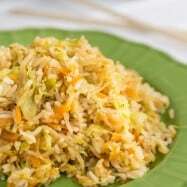 Don’t use fresh rice or it becomes a sticky fried rice and it’s not as good. To cook rice, we use a rice maker with these proportons: 2 cups rice, 2 1/2 cups water, 2 Tbsp butter and 1 tsp salt. 1. Heat a large non-stick skillet (here’s the one I love) over medium heat, add chopped bacon and saute until almost crisp (5-6 min). Skim off excess fat, leaving about 1 1/2 to 2 Tbsp in the pan. 2. 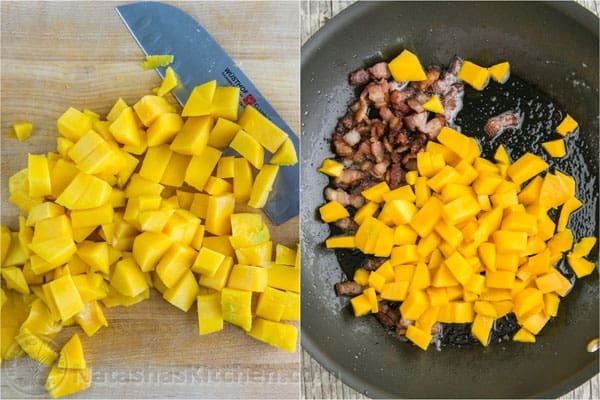 Add diced mango and saute 2-3 min over medium heat until caramelized. 3. 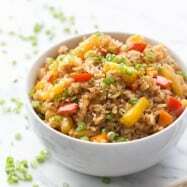 Stir in day old rice until well combined and cook until heated through (2 min). 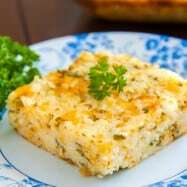 Serve garnished with green onion if desired. 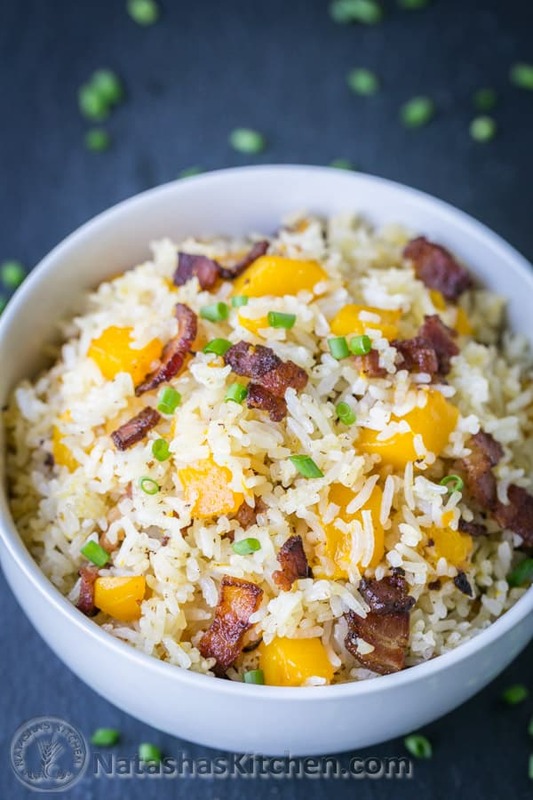 The mango caramelizes with the crisp bacon for an exotic flavor combination that will rock your taste buds. 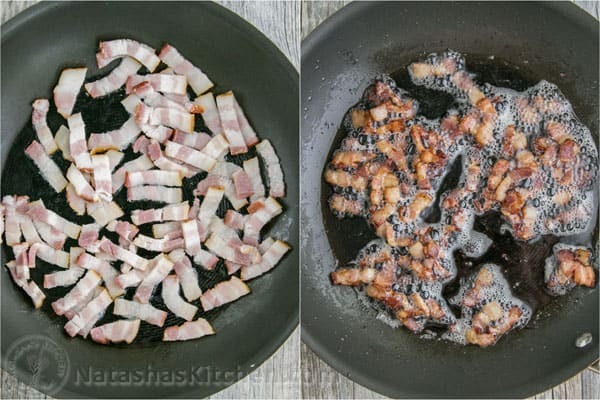 Heat a large non-stick skillet over medium heat, add chopped bacon and saute until almost crisp (5-6 min). Skim off excess fat, leaving about 1 1/2 to 2 Tbsp in the pan. 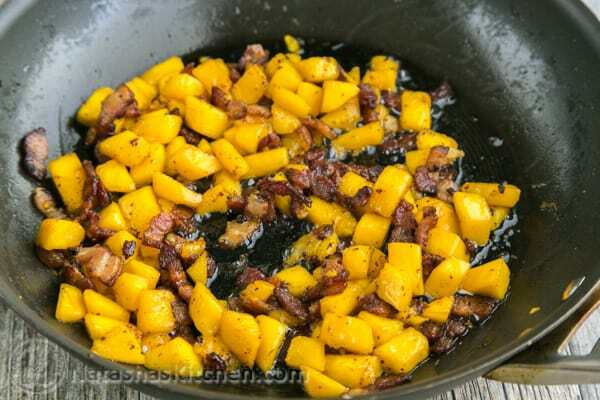 Add diced mango and saute 2-3 min over medium heat until caramelized. Stir in day old rice until well combined and cook until heated through (2 min). 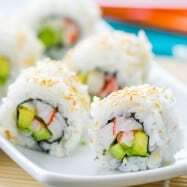 Serve garnished with green onion if desired. 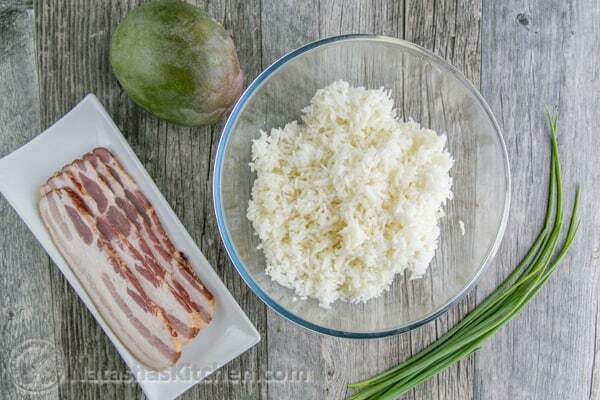 Tip: This works best with refrigerated day old rice. 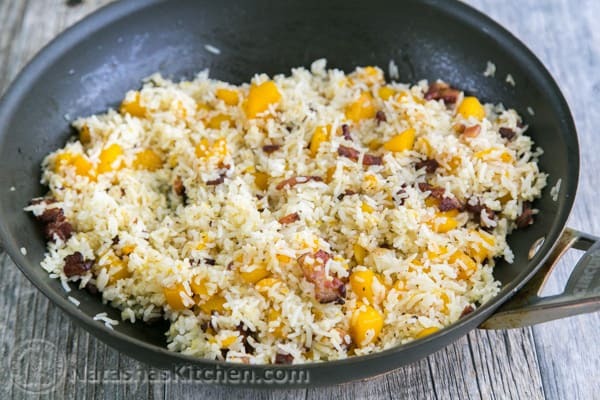 Don't use fresh rice or it becomes a sticky fried rice and it's not as good. To cook rice, we use a rice maker with these proportons: 2 cups rice, 2 1/2 cups water, 2 Tbsp butter and 1 tsp salt. 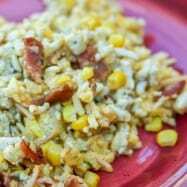 Thanks Tanya for sharing this awesome recipe with us! You should have seen Vadim and I wolf it down. (My big sis Tanya is a nurse anesthetist. No that doesn’t mean she anesthetizes nurses. She’s a nurse that does anesthesia ;). She’s basically a genius and a savvy cook. 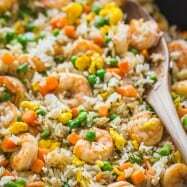 Natash, can you suggest a good deep pan for stir frying? I need a good pan for ‘one pan’ type of cooking.